Bill and I opted out today. Severe thunderstorms and an inch of rain was predicted as well as the steepest climb of the Camino. This equals mud and running water under foot. It poured throughout the night and was raining when we started out. 250 yards later – the puddles were turning into mini lakes (fun for passing cars) – our shoes were already sopping wet. We had already discussed our options over breakfast. Our egos wanted to walk but our worry for the other wanted to put that person in a taxi. 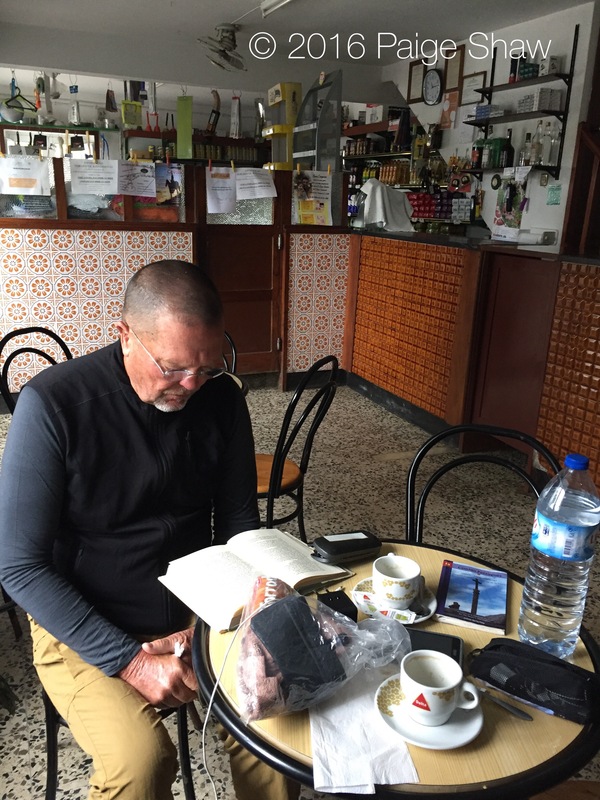 It minutes we ate ego soup – bailed on our amigos and headed for a taxi stand. Our destination doesn’t qualify to be called a town. The Alburgue doesn’t open until 1 and there are no nearby restaurants. We fortunately found a old coffee bar with basic groceries shelved behind a counter – without heat or lights and it’s 55 degrees. We planted ourselves at a table much to the chagrin of the mother in charge. The daughter yelled something to her in Portugues that I assume was “get over it – let them sit”. * Darrell, Roxanne and Chappy walked 11.2 miles today and looked like drowned rats when they showed up. All of them had smiles on theirs faces and had nothing but positive comments – no regrets! Roxanne did take an hour long bath and used 1,000 gallons of hot water but it was well deserved! 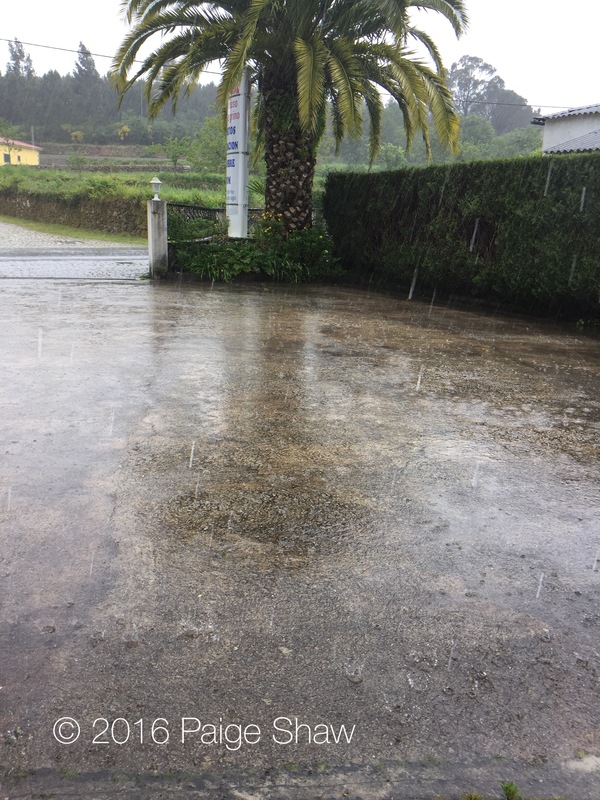 This entry was posted in Camino, Camino de Santiago, Camino Portugues, Portugal and tagged Camino, Portugal, Rain, Travel on May 28, 2016 by Paige Shaw. Dedication and determination and well deserved hot bath and drinks in the end… Cheers to you!!! 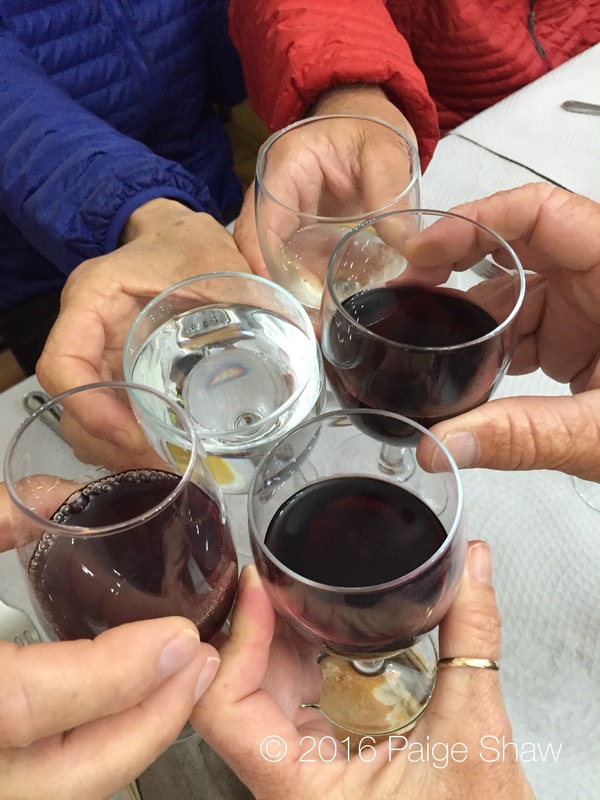 There’s an old Portuguese saying: 11.2 miles of cold, hard rain equals 1000-gallon hot water bath…you are all “walk-stars” in the end and deserve the wine, the table, the taxi and our admiration:) Big Hugs! HA! I like that proverb. There has been lots of wine! Your posts show up on my end. Thanks, Paige. I’ll trust the interwebs. Ha!